The orange tree in my backyard looked dead. The neighbor to my right said it was a shame – that it used to grow wonderful navel oranges. The neighbor that lives directly behind me concurred. But I saw small signs of growth (hope) despite the mass of dead, dry branches. The tree was watered and fertilized. It produced one lone orange which a squirrel or possum stole away with. Right after the New Year though, I began to wonder and doubt. The tree wasn’t looking so good. Would it make it? If the tree wasn’t able to produce fruit – it might be better to cut it down – I could plant two new trees in its place. Dr. Malibu was the first to notice the explosion of blossoms. Tiny flowers have filled the branches that are still alive. At dusk, the air is so sweetly perfumed by these blossoms that the scent lures you out to the backyard like a sirens song. Then the bees came – roly, poly, big, fat bumble bees, loaded to the gills with pollen. Go bees go! As Dr. Malibu would say – they were down with the struggle! We may have navel oranges yet! In the meantime, we’re enjoying the fragrance of hope! Posted on March 18, 2013, in Gardening and tagged citrus trees, Naval Oranges, navel orange trees, Orange blossoms. Bookmark the permalink. 1 Comment. How cool! 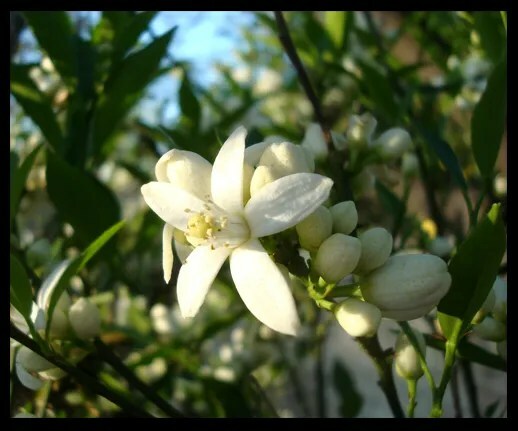 I love orange blossoms — so glad yours are recovering. I bet you have some orange marmalade in your future.